← How to Block Unwanted Links in Your Google Sitelinks? Google Analytics is one of the best free tools a webmaster can get. But, its usefulness has been limited so far as the data was only available in Google Analytics website. Today marks an important day as Google has announced a Google Analytics Data Export API. So what is an API and why should you care about it? API means Application Programming Interface. In simpler terms, it enables developers to interact with a web application data and create desktop applications or use the data and present it in new and imaginative ways than it was originally visualized. Netflix’s API let developers create useful services like Instant Movie Watcher, Netflix Queued. Twitter’s API powers Adobe AIR apps such as Twhirl, TweetDeck, etc. The Data Export API will allow developers to extend Google Analytics in new and creative ways. We can now look out for developers to integrate Google Analytics data into existing products or create new products. We can expect to see new tools to see and visualize our Google Analytics data in new dashboards and tool and gadgets. For eg. An Android application from Actual Metrics you can access your Google Analytics from your Android phone. You can see how others are using this API in these examples here. 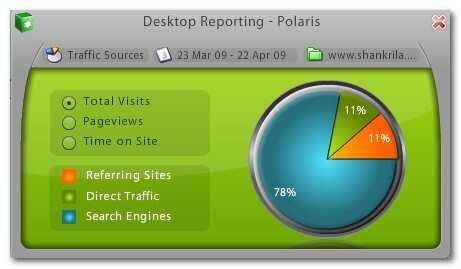 Desktop-Reporting has created a nifty Adobe AIR app – Polaris. Polaris lets you see your Google Analytics data in your desktop. Polaris defaults to the current month date range but you can change it with a nice slider tool. Polaris is free to view one website profile and it costs $15/year to view multiple sites. I am very excited to see different tools that will come out of this. Especially Ado AIR based tools like Polaris to view Google Analytics data right from our Desktop. But, Google Analytics still doesn’t offer real time statistics like Woopra, Mint, etc and that would be a killer feature to look forward to from Google. Polaris looks awesome k!! !Adobe Air has really picked up big time with the world hell bent at bringing the internet onto the desktop. polaris sure looks worth a try,only that i would have no stats to be all happy bout:D For Shankrila though it looks good!! !But the bounce rate did surprise me a bit!! Awesome interface! 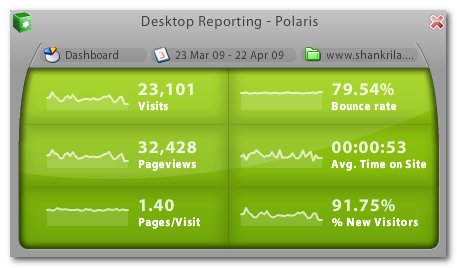 Google Analytics is a very useful tool indeed, and with Polaris, you get the stats right on your desktop, Amazing! Don’t you love the compact and cool interface? The bounce rate kinda makes sense if you consider that almost 80% of the traffic is from Google! Search traffic hardly stick around. It helped me to easily keep track of popular keywords from my blog and I can use them as anchor text to increase ranking. I will highly recommend this application for all the Google analytic user. Thanks for the post. I’m looking for Flex/AIR apps that interface Google Desktop Search API? Any direction or samples would be greatly appreciated.